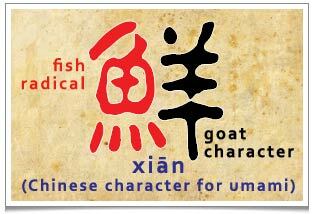 The chinese character for Umami is made up with the character of fish and goat. This character is closely related to a 4300years old dish of ‘Hidden Goat Sprawling Fish’. See recipe below. Parmesan cheese, sea salt on ripe tomatoes, soy sauce, Thai or Chinese Teochew fish sauce, miso, anchovies, shiitake mushrooms, seaweeds, Parma ham, ketchup (yes even ketchup!) and artisanal teas… all have umami. Till recently, not many people knew that there is indeed a fifth taste that is typified by the intense, savoury and pleasurable taste you get from these delectable food items enjoyed all over the world. Coined in 1906 by a Japanese scientist, Professor Kikunae Ikada, umami is the name of this fifth taste. It is this taste that detects the presence of amino acid glutamate. Umami is thought to accentuate the savoury nature of other foods. A simple experiment you can try is to taste steamed rice with and without soy sauce or a simple tomato and vegetable soup before and after the addition of a dollop of tapenade. It is also thought to lessen our awareness of sour and bitter tastes. Thus, the bitterness of Parmesan is made more pleasurable with its own umami flavour and so are the bitter gourds when stir-fried with umami-packed fermented salted duck egg yolks. Oooh! Just writing about this savoury summer stir fry makes me salivate. Since its discovery, scientists have found that while glutamate provides the savouriness that we crave, the feeling of deliciousness is greatly enhanced when combined with the inosinic acid (nucleotide inosinate) in fish like bonito or meats like beef and guanylate (guanylic acid) from mushrooms like shiitake. The Japanese dashi stock cleverly combines the “fishiness” of bonito and seaweed and the “meatiness” from the mushroom to create a liquor that is packed full of umami flavour that is quintessential to their cuisine. The umami-packed fermented duck egg yolk and the bitterness of bitter gourds makes this dish particularly savoury and delicious! The Chinese have long understood this umami synergy. The Chinese character for umami is made up of the radical of “Yu” (鱼. Fish) and the character of “Yang” (羊. Goat) and is thought to be closely related to a 4,300 years old dish called “Yang Fang Chang Yu” (羊方藏鱼) which I have cheekily translated to be “Hidden Goat Sprawling Fish”. This dish takes the two ingredients loved by North (fish) and South (Lamb) and combined into an imperial delicacy! – Slice the lamb roughly into 4cm by 2cm and 0.5 cm thick rectangles. – Cut a few slits in the fish and stuff it with slices of lamb. – Stuff the reminder of the lamb into the gut of the fish. – Heat the wok till hot and carefully pan-fry the whole fish till golden brown. – Remove the excess oil leaving about 2 tbsp in wok. 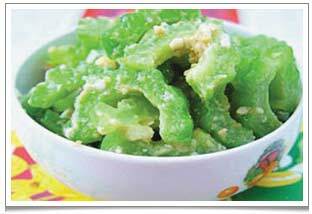 – Stir fry the spring onions and ginger till fragrant. – Add soy sauce, salt, sugar and water. Bring to a boil and then return the fish and bamboo shoots into the wok. – Braise on high heat till the sauce is reduced and fish is cooked through. There are studies to suggest that not only are we able to taste umami on our tongue, we also have umami receptors in our stomachs which can send “gustatory satisfaction” signals to our brain! This is a particularly useful trick to stimulate the appetites of people who are affected by not consuming enough nutrients or senior citizens who are less able to sense tastes and smell. Other studies also found that umami as a flavour can be used as a substitute for salt and fat in the modern diet. Unlike salt or fat, our bodies are programmed to not crave for savouries when we are full. Not a lot is known about the effects of umami on other foods. It seems to heighten our sensitivity towards sweetness and saltiness and lessen our awareness of sour and bitter tastes. It will activate salivation and create a desire to have more and this is used by many food technologists to make processed food more addictively delicious through the use of Mono-sodium Glutamate (MSG). Tea also has umami, particularly the lightly oxidised teas like the high mountain greens, whites and lightly oxidised oolongs. At high elevation, sunlight that has been filtered through layers of clouds and mist allows the tea leaves to vigorously produce plenty of amino acids (such as glutamate) and carbohydrates. The lower atmospheric temperature at high elevations at night also appears to slow down the metabolism of tea leaves thereby retaining more of these amino acids in them making them packed full of umami sweetness. The umami in tea is frequently described by its mellow sweetness. This taste originates from the amino acid called theanine. Young tea buds are prized because of their high levels of theanine. At high elevation, the sheltered sunlight slows down the process in which theanine is converted to polyphenols such as catechins. At many of my tea tasting events, I like to use a technique called “dian cha” (点茶) which is used by Chinese scholars in ancient times to indulge in competing and comparing teas. This involves warming a gaiwan (lidded cup) with some hot water for 10-20 seconds. The hot water is discarded and into the gaiwan I put some unoxidised or lightly oxidised tea leaves. The leaves are given a shake in the warmed gaiwan which allows the dry leaves to absorb some of the residual heat and moisture from the gaiwan and releasing the wonderful fragrant aroma of the tea leaves. Then more hot water is poured carefully over the leaves until the water barely covers the leaves. The little amount of concentrated tea liquor is then poured into tasting cups, a few drops in each, for savouring the umami in the tea. Many tea friends are surprised to discover how savoury, almost like a chicken stock or light bacon broth says some, can a few unadulterated tea leaves produced when I use this technique to brew our Dragon Well or Taiping Houkui green teas. Admittedly not every one can handle such intense umami flavour! Many of you who have come to drink tea with me will know that I always use soft water to brew teas. Soft water is particularly useful in extracting umami flavours because of its low levels of magnesium and calcium. These minerals react with the amino acids glutamate, nucleotides inosinate and guanylate to produce a bitter and unpleasant liquor. Hence, in all our tea tasting events, we only use pure water (having less than 10 parts per million of total dissolved solids) for brewing teas. If you would like to try some pure umami extracted from tea using the dian cha technique, do pop by to one of our tea open houses or tea appreciation master classes. Fascinating and that dish looks very interesting!